Here is an aluminum rear drum on the left and the standard cast iron drum on the right. The aluminum drum is about 8 lbs lighter than the cast version and dissipates heat much better than cast iron. 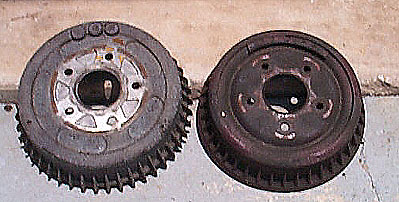 Aluminum rear drums were introduced in 1978 and ran until 1987. I have found most of them from 1978-1981 models. They are most common on the GM G-bodies such as Cutlass, Regal, Monte Carlo and Le Mans.